Berens & Miller, P.A. is a law firm located in downtown Minneapolis that restricts its practice to civil litigation and resolution of disputes. The firm focuses on pretrial preparation, trials or other adversary proceedings such as arbitrations, and appeals. The firm has also represented parties in various types of regulatory proceedings and has conducted internal investigations on behalf of clients such as corporations and directors' committees, including special litigation committees. The firm's history, outstanding litigation results and team of experienced attorneys have molded the practice to what it is today. 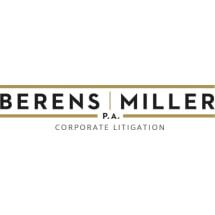 The attorneys of Berens & Miller are trusted, well known and respected among the courts and legal community to successfully represent clients in an array of adversarial matters.